Growing up with textured hair was difficult. I did not realize how important my curls were up until a few years ago. My mom wasn't very accepting of my curls either, forcing my hair to go through lots of relaxing and straightening and blowdrying. In school curly hair wasn't even cool or acceptable. 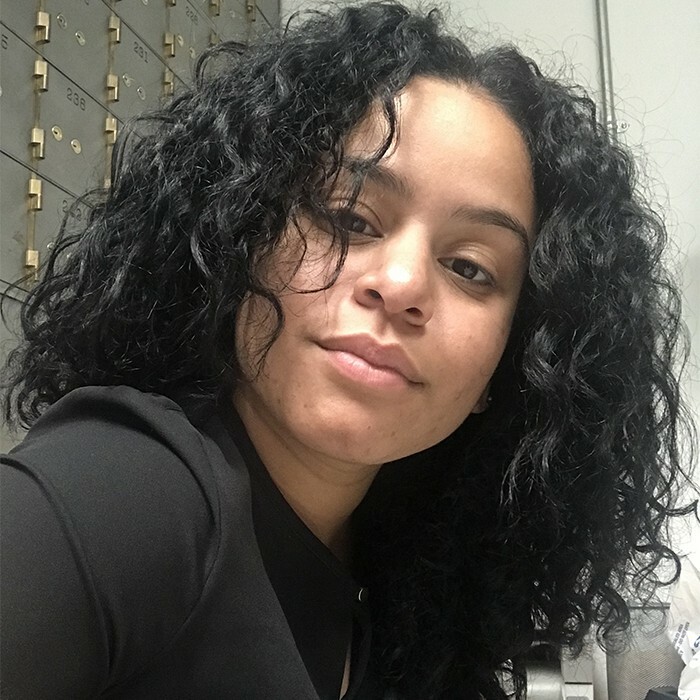 I went to a school in Bayonne, NJ, where most people had nice, straight, soft hair so whenever I pulled out my curls I'd be mocked and ridiculed. It wasn't until natural hair became a trend that I started feeling fully accepted. After seeing a lot of curly hair transitions, I figured why can't I do it? I started looking at everyone else's curly stories and even read through the whole NaturallyCurly website to make sure I was doing this right. I knew patience would be key, but I finally felt ready to let go of the straightener and fix all this heat damage. I've been working in a professional business environment since I was 17 and due to the mocking in school, I was always scared my big hair would not look professional for work. Once I started wearing my damaged, natural hair to work, it was very empowering. It was a "hey this is me, this is what's happening now" kind of moment and I loved it. It took me a while to feel comfortable in my own hair, but patience and a growing confidence helped me through it. 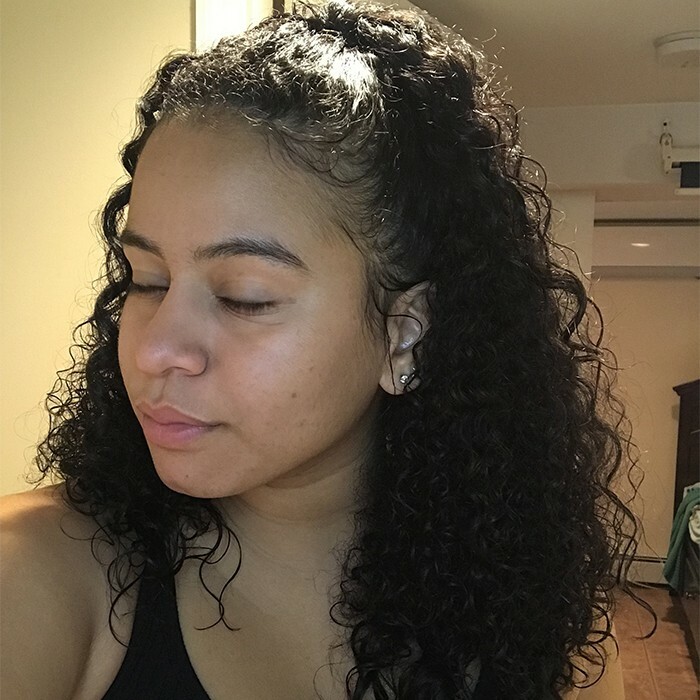 I was able to learn curly hairstyles and what works for me. At night my favorite way to protect them is by putting my hair up in a pineapple. I also sleep with a silk pillow. I used to sleep with a silk bonnet when my curls were a bit shorter but I always felt like my hair was too long to be in the bonnet and it made my curls look all deformed. The pineapple method is much better for my hair. My curl crush definitely has to be Lauren Lewis aka @laurenlewiss. Her curls are absolutely beautiful as is she. She does this one slick-back bun that just suits her face so beautifully. One day I want to be able to pull it off just like her. Her curls are also big and beautiful and I believe in a way mine are similar (if I didn't have heat damage, of course). Even a messy bun looks great on her when she's just traveling or being lazy and I think it's because her curls are just so nicely defined. She's also very free-spirited and travels all over the world modeling. Definitely my biggest curl crush. My curly girl essential definitely has to be the OGX Coconut Curls conditioner. I take that thing everywhere I go. I have used other conditioners including other OGX lines, but this is the one that just hydrates my hair the best. I also can't live without SheaMoisture Curling Gel Souffle. Even when I was dying my hair all sorts of light colors, this gel really defined and hydrated my curls. The gel is very oily and so helpful when it comes to hydration, which has always been my biggest problem. These two products saved my life. My current regimen starts with a clarifying shampoo, OGX Coconut Curls Conditioner , and then a deep conditioner. I always debated whether I really needed to condition twice, but it seems my hair needs the extra help. When I don't do it this way, I get totally different results. I then style with SheaMoisture Jamaican Black Castor Oil Strengthen and Restore Leave-in, Dark and Lovely Au Naturale Curl Moisturizing Souffle, and my trusty curling gel souffle. Depending on when wash day is, I normally plop my hair in a t-shirt overnight for best results. When I was first transitioning, I must give credit to Camille Rose's Curl Maker because that was my No. 1 gel at the time. It helped me manipulate my curls back to what they are supposed to be. After my curls were at a better state I went back to SheaMoisture Coconut & Hibiscus Curling Gel Souffle. The most challenging moment of my journey has been staying patient with my hair. Some mornings it was really rough getting a hairstyle together and taking four or five tries to achieve the perfect bun. There were times I felt hideous because my hair just wasn't working for me nor was it curling. Its so hard to stay consistent and be patient and let your hair blossom, but the curly journeys I've read kept me motivated. The technique that has had the biggest impact on my hair is brushing with the Denman brush, and hair plopping overnight. The Denman brush is super effective for curl definition. I've tried multiple methods including brushing in the shower and brushing while styling and both work. Hair plopping overnight helped manipulate my curls. It gives a bit of an accordion effect, making my curls much more defined. It also helps capture moisture, which my hair is always in dire need of. My advice for women still struggling is to appreciate the little gradual changes and trust the process. It was hard for me to acknowledge any change in my hair, but now that I look back, my curls have come a long way and it's only been a few months. So if you're stressed because you can't pull any hair-do's off with transitioning hair, just work with what you got. Do a nice little bun or some twists, but just DO NOT straighten it.